I’ve been an avid bike commuter since I can remember. After years of taking the same way to and from work, this summer I changed my route to go through downtown Denver on my way home. Not only is this route considerably faster, but it allows me to take advantage of Denver’s new 15th Street protected bike lane. 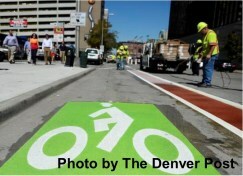 This protected bike lane—the first of many planned for Denver—is part of a larger nationwide policy trend to physically separate cars and bikes to increase the safety of bike commuting and new data is showing the policy works. However, there are marked differences in how this seemingly straightforward policy intervention is implemented at a local level, and how it is experienced by cyclists. After a few months of using the 15th Street protected bike lane, these intricacies of local implementation are clear. I routinely have to dodge cars and pedestrians who are unfamiliar with the new layout, even when I have the right of way. My fellow cyclists are also still learning to navigate the new bicycle-oriented streetlights that are part of the lane. It is clear that local-level tweaks to this national policy solution are necessary and inevitable. Colorado’s communities are currently implementing another national policy, albeit on quite a larger scale. As a nation, we’re approaching the first year anniversary of coverage expansions and other major provisions of the Affordable Care Act. Through our Health is Local project, CCMU has been documenting the local variations and impacts of health reform around the state. In four communities— the city of Colorado Springs, and the counties of Montrose, Summit, and Yuma—we interviewed the same group of local leaders multiple times throughout the year, collected the perspective of community residents, and gathered data, photographs, and other media, in order to comprehensively document this narrative. Adequate preparation prevents long-term problems. Communities that were well-informed and began local preparation for change felt more confident going into 2014, and have seen greater success. There are no one-size-fits-all solutions. Rural communities have always faced a unique set of health system challenges, but changes ushered in by health reform haven’t provided much relief. Collaboration is essential. Any major change is going to be accompanied by a set of unexpected challenges, and communities with strong, collaborative relationships in place were better able to deal with and overcome those issues. The future health reform efforts of each community in Colorado will be different; some may need to focus on enrolling more residents in coverage, while others look to establish strong collaborations among leaders or expand their health care workforce. Whatever their priorities, though, I hope these lessons continue to inform their work and ours. And, as other national and state policies come down the pike, whether it’s bike lanes or health care, I hope we remember to keep the conversation local.